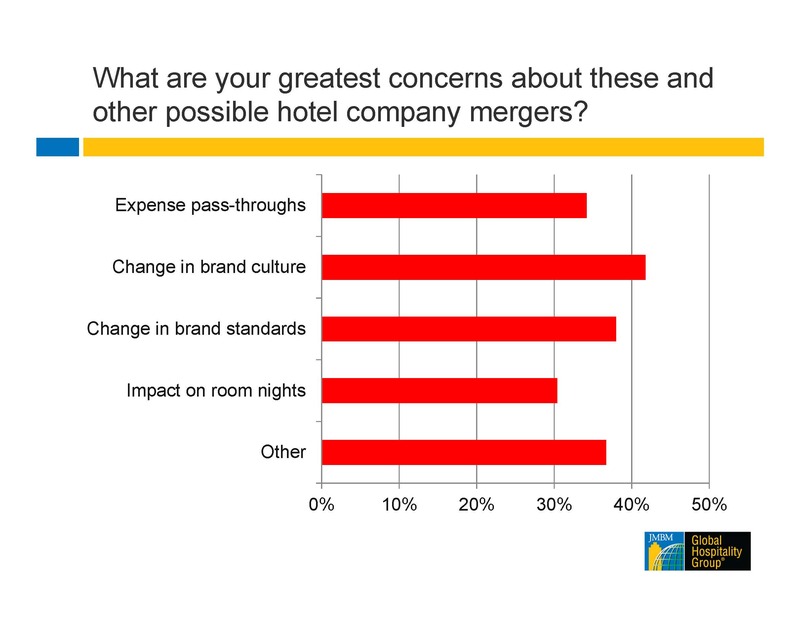 Global Hospitality Group® survey results: What does all the recent consolidation in the hotel industry mean to different stakeholders? Marriott closed its acquisition of Starwood on September 23, 2016, following Accor’s closing of its acquisition of Fairmont/Raffles on July 12, 2016. Other consolidations may already be underway. In any event, most of us in the hotel industry expect some very important consequences to result from such transactions. 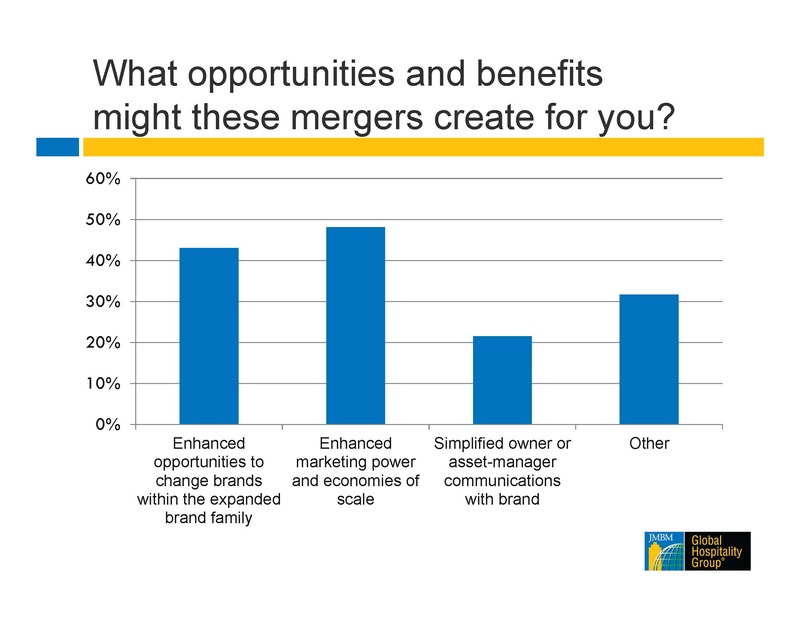 The hotel lawyers at JMBM’s Global Hospitality Group® thought it would be interesting to gather the views of various industry stakeholders as to the likely impact of these mergers. 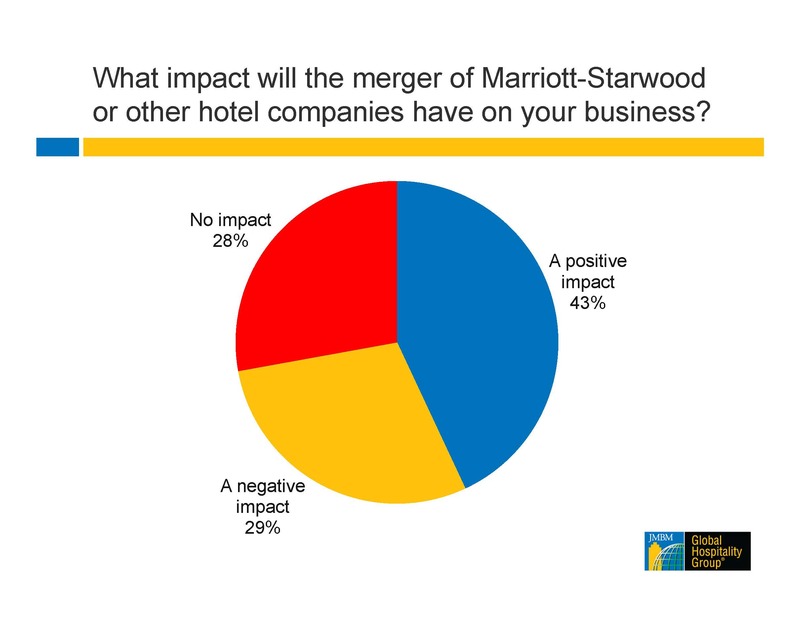 So just prior to the closing of the Marriott-Starwood deal, we prepared a short survey and reached out to our industry friends and colleagues, as well as readers of HotelLawBlog.com. The survey results are in and counted! Here they are, along with a few comments. I read Bill Marriott’s reasoning for the merger and agree with him. Will likely result in a consolidation/elimination of some brands so we’ll have fewer opportunities to bring in new and varied product. Marriott/Starwood will be messy for both of those companies with so many overlapping brands and totally different loyalty programs. The Accor/Fairmont merger will be easy, with no overlapping brands. There will be the same amount of competition. Generally view consolidation as a positive; however, the Marriott-Starwood merger does put a lot of industry weight in the hands of one organization. Fewer hotel companies to talk to for operator tie-ups. May lead to monopolization in certain markets. Less competition for flags = fewer choices. Potential hotel owners will be impacted negatively. From the owner side, the competition will be less, especially in management fee and services. When Marriott acquired Ritz-Carlton, the standard and consumer perception of Ritz-Carlton lost its symbolic, high-end flair. I believe Marriott’s business culture vs. Starwood’s will eventually clash. Positive impact for the holding companies that associate with those brands, for distribution side and corporate bargain power on procurement and regional vendors. For other brands, if not distinguished themselves in service and product offering, then it’s hard. The combined companies will have greater leverage over OTAs, which should result in better booking terms/fees. However, from a franchise negotiation, the owner loses leverage to negotiate one brand over/against the other, so franchise fees/expenses will likely increase. Less competition usually results in higher cost. It will dilute the business in locations where we have a former Starwood property competing with a Marriott. Assistance to the owners vis-á-vis brand, in adjustment to changes which will come after the mergers. Opportunities for integrating legacy systems. At this early stage, I see few opportunities and/or benefits that may be created through this merger for our business. Over the long-term, some in the industry may take advantage of Option #1 [Enhanced opportunities to change brands within the expanded brand family], while those already associated with “Marwood” should see benefits as indicated in Option #2 [Enhanced marketing power and economies of scale]. It will likely be a couple of years before the any stakeholders see results outlined in Option #3 [Simplified owner or asset-manager communications with brand], although there should be some, since many acquisitions usually result in increased efficiencies. It will make Marriott even more difficult to deal with, which could create additional opportunities for consultants with experience negotiating with them. Ability to obtain better concessions from some of the smaller brand families. Marriott will absorb Starwood culture within months, the Starwood culture will fade with the wind. The economies of scale will help Marriott, but not so sure of benefits to owners. Starwood-branded properties may benefit from enhanced marketing, but there will also be more competition now amongst Marriott brands, and some properties may face unpleasant rebranding options. Enhanced opportunities to change brands, yes, but will some face major capital improvements for rebranding, and will the new brand be an upgrade or downgrade? I am aware of a Renaissance that Marriott will not rebrand as a Renaissance, but they are fairly substantial cap ex, and the brand that Marriott is offering the owner to convert to is a Delta. Those who have enjoyed a more progressive and flexible Starwood culture will be shocked when they begin to experience the Marriott rigidity. More heavy-handed negotiations between owners and brands about cap ex and brand positioning. Marriott (for example) is likely to present a menu of brands with related PIP requirements to owners. Homogenization of the brands, particularly as we enter a downturn and cuts are made. Differentiation will disappear or be negated operationally. Potential brand over-saturation in the market (too many from one franchisor), which has a negative impact to distribution of room nights when it comes to the reservation system. Also, brand loyalty will be disbursed over more brands now, so someone who is generally loyal to the Marriott brands may now switch some stays to Starwood brands. This doesn’t hurt the franchisor, but does trickle down to negatively impact the hotel owner. One of the main threats that I see to owners of existing hotels is the potential for brand de-emphasis or phasing out caused by the significant brand overlap that now exists within the combined Marriott/Starwood portfolio. Will likely require additional capital spending over time to make brand standards more consistent, and even to do updated signage, marketing materials, and collateral marketing materials. The impact of a change in brand is significant, as is the cost of adhering to/converting to brand standards. I would be very concerned about these issues as an owner of a branded property, particularly in the case of older, full-service assets. What brands will Marriott continue to support as top-tier brands, and which brands will they make “conversion” brands that will no longer have the same brand support and consumer confidence? Where ever there is significant change, there is likely to be great opportunity for those who act quickly enough. There are also likely to be serious challenges to be dealt with. The Global Hospitality Group® has unequaled experience in helping clients with both sides of that equation. We would love to hear your thoughts and explore any way we might help you create value with the hotels you touch.